Welcome to Blossburg Pennsylvania. 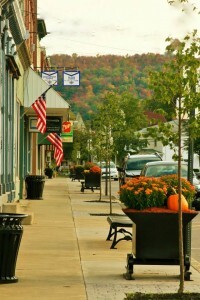 You can stop in an say hi while traveling on US Route 15 / Future I-99 Corridor, mid-way between Corning, NY and Williamsport, PA. Blossburg is a small community with almost everything a traveler needs. We do suggest opening Google Maps to check out the location of our gas stations (Full Service and Self Serve), restaurants, coffee shop, bar and grille, grocery store, pharmacy, hardware store, and Island Park recreation area. When you first exit the highway, you’ll see the Kwik Fill/Red Apple, take a left turn, drive for a 1/4 mile, take a right turn over the green bridge and you’ll enter downtown Blossburg. We’re sure you’ll find something you like, so see you soon! Have an event coming up? Email news@blossburg.org to get it in News and Views, Blossburg, PA Facebook page, Welcome Sign by the green bridge, and other places. Senior Yoga classes are coming back on Tuesdays, for 10 weeks starting March 26th at 9am. All levels welcome; while the class focuses on seniors, others who feel their health can benefit may attend. For more information about any of Blossburg Memorial Library’s activities and amenities, contact us at 570-638-2197 or blosslib@epix.net. Look for us on Facebook. Location: Blossburg Memorial Library, 307 Main St. The spring session of Preschool/Homeschool Story Hour will be held at 11am on Tuesdays from April 2nd through May 21st. Children and their caregivers will socialize, listen to books, and be engaged in fun and educational activities. No preregistration is required. Municipal Authority Meetings are open to the public. Bible Study/Prayer Meeting, Everyone is Welcome! New members welcome! Meets monthly on the first Thursday at 9am in the Blossburg Memorial Library Community Room. Baked or Fried Fish, Mac & Cheese, Vegetable, Roll, Cole Slaw & Dessert. The Chairperson says: "Our assorted foods (non-perishable food items) is low. Please consider donating a couple cans or boxes of food to the pantry. Items may be placed in the wood crates which are located inside the church by the front and side doors." Teens & Tweens – come to the Blossburg Memorial Library on Thursday, April 18th at 6pm to help plan a project to make Blossburg more awesome. We are working on a youth-driven project designed to bring community members together, with fun and engaging activities for people of all ages. Gain leadership and teamwork skills while learning about getting involved in your community! Free pizza, beverages and popcorn will be provided. Bring a friend and join us! The library will once again participate in Blossburg’s Community Yard Sale. Tables are available to rent for $10 in the library’s parking lot (Community Room in case of rain). Sell your stuff at the library! Shop, have fun, help raise funding for the library. Reserve your spot asap! Saturday, April 27th 8am to 2pm. "Spring Clean Up" will be held on April 30 & May 1. Put your discarded items out on your regular garbage day. Garbage in one spot and extra trash a little separate from your regular garbage.